Present cold bottles of wine and champagne to your guests in this attractive and practical 9" stainless steel wine / champagne bucket. Ideal for table service or room service applications, simply fill this bucket with ice to add an extra flare to your beverage service. Use this bucket on its own, or pair it with its compatible stand (sold separately) for table side service! Keep your best champagnes or wines pleasantly chilled to provide guests with a superior drink service. "The 9" Stainless Steel Wine/ Champagne Bucket- 8 Qt. is well made and elegant. It is easy to clean and keeps champagne cold. I would recommend this for any bar or for residential use." Create an eye-catching presentation that matches the elegant look of your party, event, or tabletop display by simply adding these additional elements to your tabletop. These dishes and accessories can be mix and matched together in a variety of ways to form a coherent display that will both impress your guests and draw attention to your signature dishes. Check out our “You May Also Need” section or the brochure PDF to find out more about the items that can complete your display! 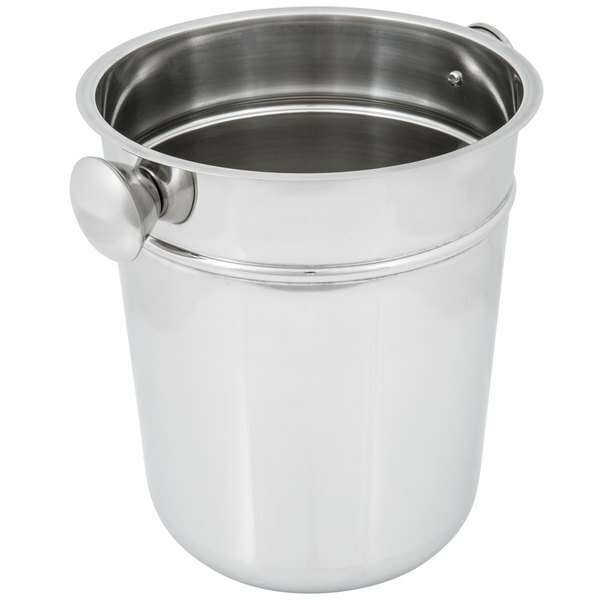 Made of stainless steel, this bucket is extremely durable and boasts excellent temperature retention. It can easily keep your ice chilled to keep your champagne on ice during your parties or events. 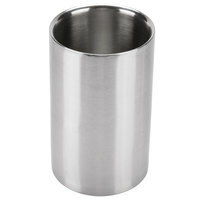 Plus, the sleek appearance will be a great addition to your tabletop! 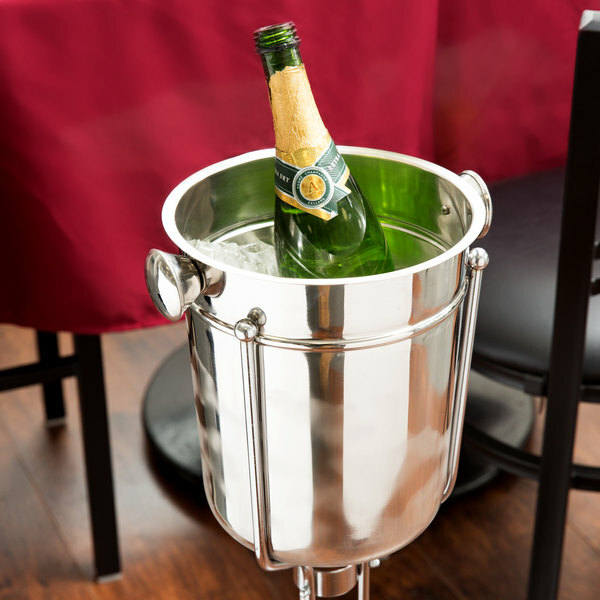 Use this champagne bucket to display your best drinks at an event, or send it to a guest's room for excellent room service. 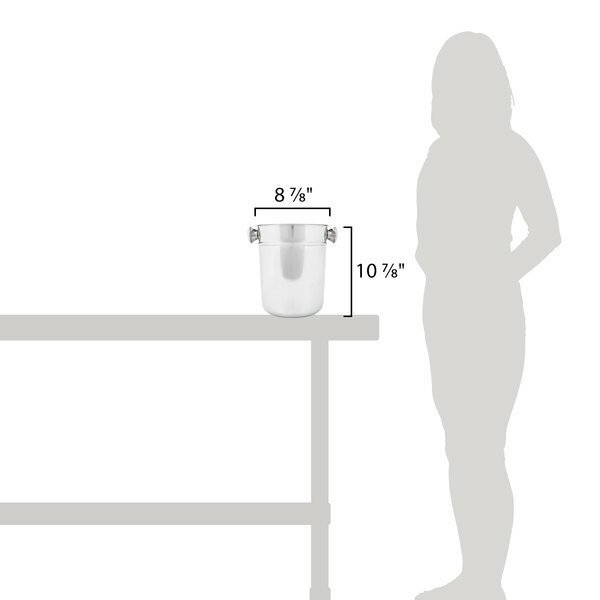 A knob on either side of the bucket also allows for more convenient transport to and from tables. 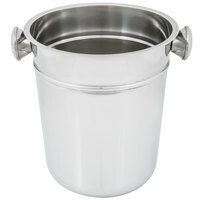 Item #: 92246801 9" Stainless Steel Wine / Champagne Bucket - 8 Qt. 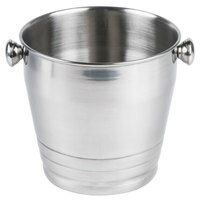 Item #: 922WB4HV 8 1/4" Heavy Weight Stainless Steel Wine / Champagne Bucket - 4 Qt. Franmara 9042 Monterey Jumbo Clear Customizable Acrylic Oval Cooler - 15 3/4" x 11" x 9"
Franmara 8328 Heavy-Duty Customizable Double-Wall Oval Banquet Party Tub - 18 3/4" x 15" x 9"
Regency Stainless Steel Double Tier Speed Rail - 32"
Overall User Rating: 9" Stainless Steel Wine / Champagne Bucket - 8 Qt. 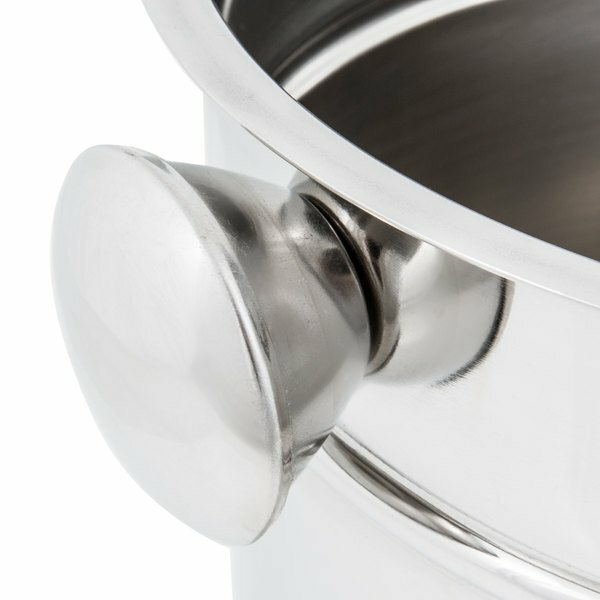 The 9" Stainless Steel Wine / Champagne Bucket is an elegant way to present bottles. We used these for a bride who wanted bottles at each table for her New Years Eve wedding. They looked much more expensive than they were. Love this Champagne Bucket. It came out great for our wedding. Exactly what I wanted and described. Will order more soon. You will not be disappointed. Love the champagne bucket we recived today. It is a nice a sturdy bucket. It fits the stand nice. Can’t wait to start using it. 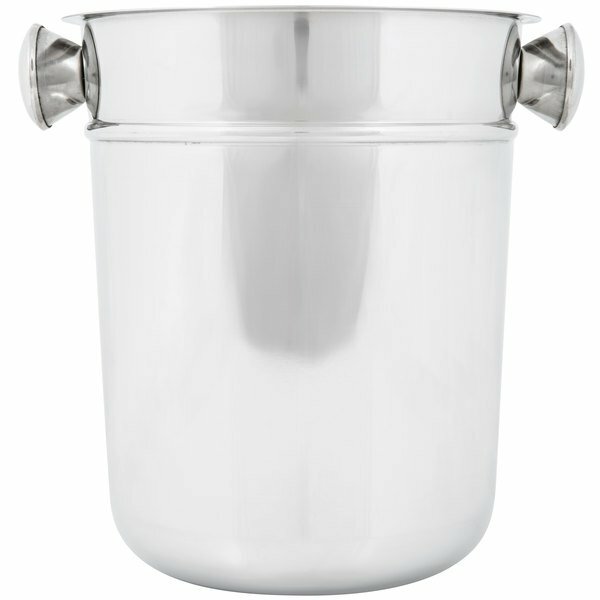 The 9" Stainless Steel Wine/ Champagne Bucket- 8 Qt. is well made and elegant. It is easy to clean and keeps champagne cold. I would recommend this for any bar or for residential use. Recommend. Great size, you can fit two bottles of wine in this if you wanted. Easy to clean, and durable. Upholds being washed in the dishwasher but will need polishing over time. I love it... I actually impress my family at my niece graduation party. I would recommend this beautiful entertaining item champagne bucket to anyone else. Very basic buckets. It's great that it's all stainless steel. Makes it easy to keep clean and shiny. I did think that the rounded bottom would make it unsteady on a table, but it's not. 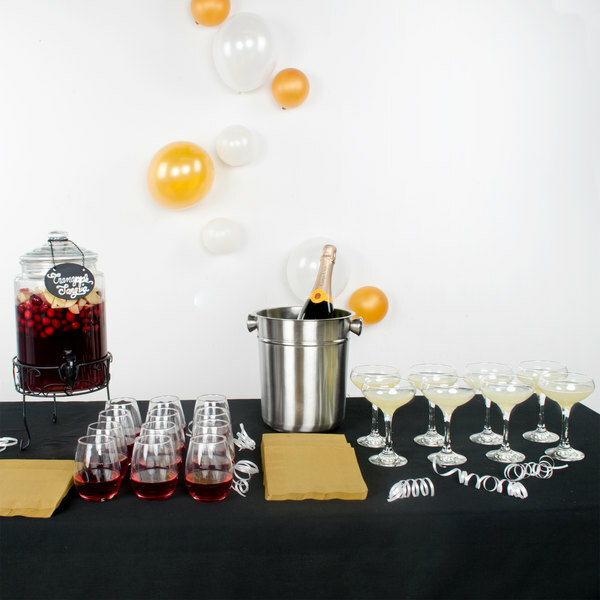 Wine and champagne bucket was a great product for my event, came in such handy as it was easy for the waiters to go up and each table had there own bottle with wine bucket so made it easy to refill guests glass's. Would definitely recommend again the quality was awesome. Great product for the price. Nice for larger events too since you can fit up to three bottles of wine and two bottles of champagne. Also have used there as ice buckets. The quality was much better than expected. Especially considering the very low price. We will definitely order more in the future. Received many compliments on the bucket. This wine bucket goes great with the stand. It can hold 2 or maybe even 3 regular sized wine bottles. It is a steal for its price. You wont find any wine bucket at this quality for this price. A must buy for anyone who likes to entertain! This was much more than we expected for the price. We purchased this to make a bridal gift basket (I spent less on this then I would of on a wicker basket and this will be used much more). Also a classic yet contemporary design that would fit any decor. Very shiny good quality steel. We use them for champagne on our patio. Guest love them and the cold liquid inside the bottle, a must have. Excellent purchase from your store. I received my order and was very glad. I can't wait to start using it for my event planning business. I love using this at home when we are having dinner to keep our wine cool. and I have just feel in love with this! I would recommend it to anyone who uses bottles and needs to keep them chilled for a little time! Nice Champagne Bucket at a great price. High quality stainless steel helps keep the cold inside the bucket, which means your wine stays cold as well. Large enough to fit a large bottle along with plenty of ice. These worked great at my daughters wedding! They added alot of spark to the tables and were funtional in keeping the wine and champagne cold all night!! This is a very attractive way to present full bottles of wine and champagne! It works nicely to keep a bottle of sparkling water chilled as well!! This is a really nice wine bucket. It is great for a table side presentation. After the sommelier opens the bottle, you can have the rest sitting on ice! 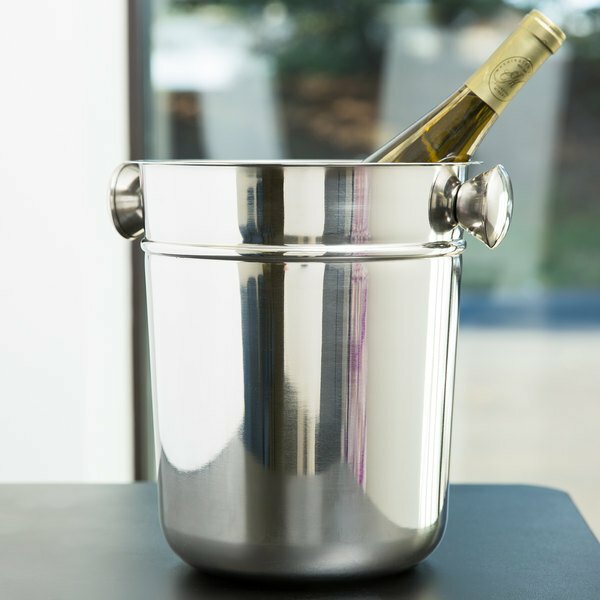 This beautifully made 9" Stainless Steel Wine / Champagne Bucket is great for your next get together to keep your favorite spirits chilled to perfection. Prompt delivery and great price. Very useful, attractive and practical. 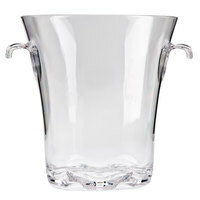 It goes well with the 32" (92246800) high wine bucket stand. I will enjoy my wine bucket when serving dinner.